The Skinny: Uncommonly well-produced early nineties flick from director Gordon Chan and producer-star Lawrence Cheng. The film seems to start with promise, but implausibilities and annoying characters render it nothing more than average. 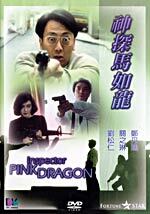 by Kozo: Geeky Lawrence Cheng produced and starred in this action-comedy that's surprisingly well-made, but amounts to little more than a fluffy time-waster. He stars as police officer Ma, who's all bark and no bite. An annoyingly whiny boaster, Ma gets his chance to solve a real case when he accidentally happens across a land-development bribery scheme involving former classmate Yau (Tony Leung Ka-Fai). It seems Yau was taking money from evil developer Teng (Damian Lau), but his inability to get the job done earned him a bullet. Thanks to movie-like circumstances, Teng believes that Ma is the real head honcho of urban development, and tries to arrange a new deal with him. At the same time, Teng wants to get Yau's payoff back from Yau's mistress Julia (Rosamund Kwan), who Ma lusts after big time. And, Nina Li shows up as Ma's cousin/fiancee, who's insanely jealous but still very submissive. Given Ma's all-talk character, the common plotline here would be for him to become an actual hero, thereby making good on all his big talk. Ma certainly gets his chance, but he surprisingly stays exactly the same for the entire film. The beginning of the film has him coveting Julia and dissing his doting girlfriend. By the end of the film, he's still coveting Julia and dissing his girlfriend. He does get to do some law enforcement stuff along the way, but he never seems to overcome any personal barriers. As such, the film becomes a ninety-minute showcase for the comedy talents of Lawrence Cheng, which really isn't something that I would normally pay to see. His delivery can be sometimes amusing, but more often than not he's simply annoying and worthy of audience disdain. At least some of the supporting actors fare better. Damian Lau turns in a fine performance as the charming heavy, and Nina Li is amusingly animated as the jilted girlfriend. Rosamund Kwan gets to do more than her usual "flower vase" thing, but her character is annoyingly rudderless. She appears to dislike Ma at first, but later comes to appreciate him - though it's really questionable as to why. Her inexplicable character is a microcosm of the whole film, which simply plods along with no real tension or driving narrative. Basically, we just follow Ma as he happens into situation after situation. And if we're lucky, we get to laugh at the same time.